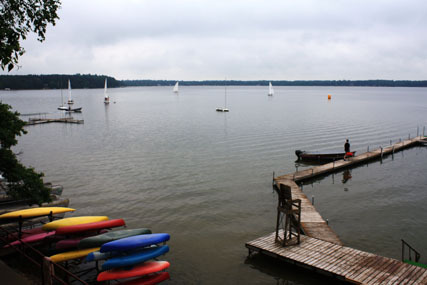 GrandView Lodge on the shores of Gull Lake in Northern Minnesota provides a perfect opportunity to drop the kids off—boys at Camp Lincoln and girls at Camp Lake Hubert—and settle in for some well-deserved rest and relaxation of your own. When it’s time for the kids to go to summer camp, why not leave work behind and enjoy a grown-up style of camp sans bunkhouse and mess hall? Soon after the camps were established in 1909, in what was then a remote part of the state, the owners recognized that a place was needed to serve families who brought their kids to camp and wanted to stay in the area. While children from second through 11th grades keep busy with dozens of land and water activities, parents can spend quality time at adjacent Grand View Lodge (You can bring the kids, too). 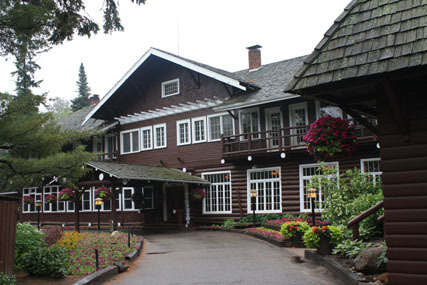 A National HistoricLandmark, Grand View Lodge has evolved from simple camp stop to a major resort. It qualifies as a member of Historic Hotels of America because it has maintained the historic architecture and ambience of the original lodge building for more than 95 years. Easy to get to now, Grand View Lodge is located in the scenic North Woods/ BrainerdLakes region. About the camps: Sam Cote and his son Rex are carrying on traditions started by Sam’s grandfather Brownie Cote more than a hundred years ago. “We’re in the youth development business,” he says, noting that kids have come to the camps from 26 states and seven countries. “Kids learn skills for living together—something the world needs today,” Sam adds. 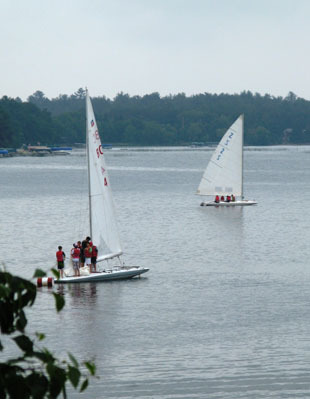 Sailing is a primary activity at the camps. The camps accommodate several hundred children during each two-week session. More than 30 land activities such as horseback riding, golf, tennis, rifle range, and climbing wall are available. Sailing, canoeing, windsurfing, fishing and other activities make use of the 1300 acre lake which forms the center space for the two camps. “We’ve maintained the original values of God, others, and self set by my grandfather, although our expectations for a quality program keep growing. We provide a higher level of experience now, as we aim to correct nature-deficit disorder,” Sam says. Kids must be unplugged when they come here. “We focus on building community, which means talking with each other,” he adds. 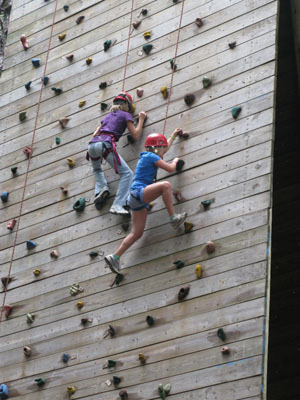 Kids stretch their skills on the climbing wall. A special option is the week-long family camp during which members of a family live in a cabin and do activities together. If that sounds too rustic, you’ll love the amenities at Grand View Lodge. It has grown from the original lakeside cottages, which are still in use, into a quality destination with 72 holes of golf, spa, a variety of high-end rental properties, outstanding restaurants and shops, and a conference center. Still, it retains the comforting ambience of a family-run camp. What to do at Grand View Lodge? 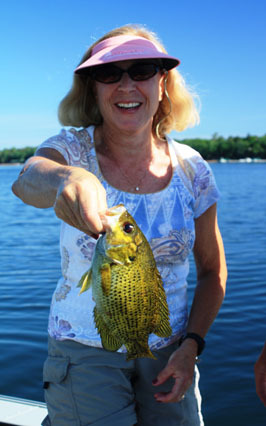 Take a fishing excursion on Gull Lake, either guided or on your own. Cast your line for wall eye and bass in the clear glacial waters. 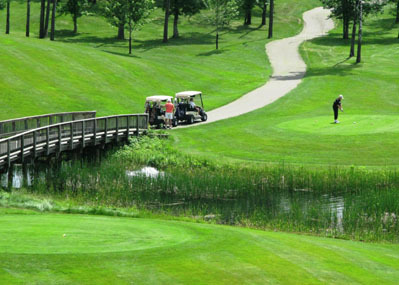 Swing your golf clubs at Arnold Palmer’s Deacon’s Lodge, The Preserve, or one of three nine-hole courses. Go sailing, horseback riding, swim in the covered pool or lake, or walk along paths on the property. Take a bike ride along the Paul Bunyan Trail, a converted rail trail that extends for 100 miles (much of it paved) through 14 towns. One of the longest and most scenic trails in Minnesota, it meanders beside meadows with views of Gull Lake and through stands of pine, fir, birch trees. Beautiful, green golf courses provide fun and challenging play. When you feel the need for pampering, head to the Glacial Waters Spa for a massage, manicure, pedicure, or the heavenly Vichney shower with streams of water massaging your back from seven ceiling-mounted shower heads. Enjoy a lip-smacking good meal at the Italian Garden Restaurant, or sample fine dining at Sherwood Forest Restaurant, set in an historic log cabin. Finish the evening on the beach watching the sunset, sitting on the dock, or roasting s’mores over a campfire. Or, if you feel like singing, join guests at the Northwoods Bar for Karaoke night. Kids can play ping pong, checkers, and other games in the adjacent rec room.